There isn't any snow here yet but that hasn't dampened the holiday spirit here in Sugar Grove, NH. With Christmas just around the corner all the family is sneaking round the house, secreting in shopping bags and wrapping up packages. Grandma has spent the last few days locked in her room. We can hear the rapid clacking of her knitting needles right through the door. Holiday food preparations are underway too. Cooling cookies cover the counters in the kitchen. There's a turkey brining in the refrigerator and Grampa has made a last minute batch of maple popcorn balls. Carolers stopped at the farm just last weekend, their cheeks rosy and voices slightly off key as they made merry in the crisp night air. My niece and nephew will appear in the holiday concert at the school celebrating the season with renditions of Jingle Bells and Deck the Halls. It all feels like the holidays. It all feels like home. 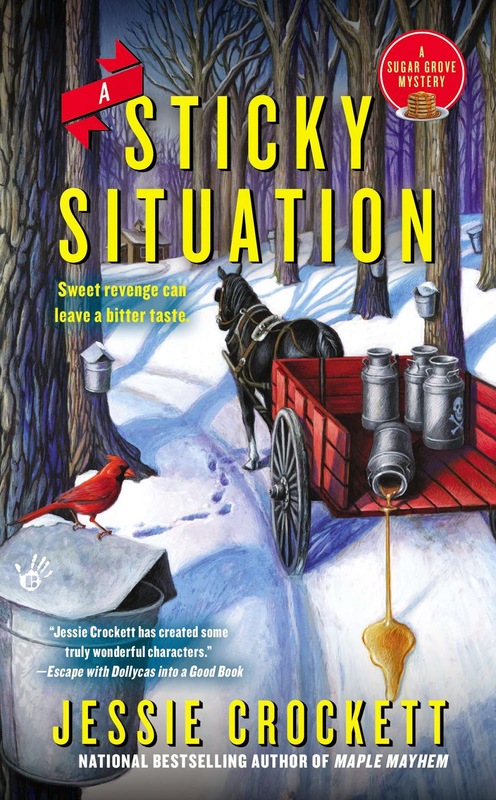 Leave a comment about what you do for fun and festivity throughout the season for a chance to win a copy of one of Jessie Crockett's Sugar Grove Mysteries. We do a lot of visiting and baking over the holidays. We go through the neighborhood to see the decorations, and we watch Christmas movies. We listen to Christmas music day and night, and try to watch a Christmas movie every few nights. We also enjoy driving around town looking at all the decorations and lights. Christmas music is on my favorite radio station 24/7, Christmas movies on TV, Christmas jigsaw puzzles, Christmas books! We like to drive around the neighborhood to see all of the cheery holiday decorations! Enjoying my collection of Christmas decorations. Visiting family and friends and eating way too much! Watch Christmas movies, especially A Christmas Story. For New Years we watch old black and white films. There's usually a theme, Fred and Ginger movies, the Topper series, Cary Grant screw ball comedies, etc. I like to listen to Christmas CD's as I do my housework. Our season is already done. But We turned twenty pounds of potatoes and ten pounds of onion into a huge pile of potato latkes for the yearly Family Channukah get together. Drive around the city and look at the lights. kamundsen44ATyahooDOTcom. This year's best celebration is that my daughter will be home for the first time since moving for a job in August. This time of year I like the holiday music and movies!! Love this site, and I'd love to win! Happy holidays!! I read and watch TV simultaneously. Some days with more success than others. We enjoy driving around looking at Christmas lights when we're not visiting with friends and family. Shopping is also on the schedule. Bake for gifts, listen Christmas music and watch movies. My hubby and i like to wrap the grandkids gifts and also we give a stocking to all the grandkids no matter what state they live in and that we really enjoy stuffing them and inside there is always an ornament so by the time they are 18 they should have 18 stockings and ornaments this is a tradition i did for my kids that are now 37 and 33 . Of course i stopped the stocking but until they are married i won't stop the ornament giving. Most of the fun and festivity revolves around family 'do togethers'. Because of my granddaughter's work schedule, the most recent one involved a rather late in the day trip to see Santa for her children. Got a good picture of them, but it was a case of catching the 2 yr old as she left the scene--she was NOT interested in sitting in that stranger's lap! I like to enjoy spending time with my sister and relaxing. Merry Christmas and Happy New Year! On Christmas Eve, we all gather for a meal of Swedish meatballs, mashed potatoes and lingonberries. Than we open presents with carols playing on the radio- or preferably one of the TV channels is running the 'yule log' program. I like it when we drive around to see nearby decorations and lights. I'll visit with my parents-we'll eat ALL day long and watch Christmas films. Tomorrow, my cousin and I are going to a neat cocktail lounge for drinks after work and Christmas eve, I'll veg in front of the tree after work and enjoy the peace, quiet, and lights! I do a bunch of baking and cooking and we usually have a neighborhood party at someone's house. Each year we take turns on who will host. We drive around on Christmas Eve looking at all the lights. There are a few places in town where every house decorates and its fun to see. Mostly watching Christmas movies on TV, but I will be bingeing on English detective shows this long holiday weekend. Just checked out a stack from the library. I also love to eat turkey and pumpkin pie. I don't have much family. I like putting up the lights and seeing those and watching Christmas movies and reading books that take place at Christmas. I do a lot of reading to get through this time of season. We love to go tobogganing after Christmas and then go home to hot cocoa and Christmas cookies! Merry Christmas! We drive around to see the decorations and light displays, and we watch Christmas movies. We make cookies, special drinks and cheeseballs! Sherylhbooth@gmail.com Forgot to leave my email! Christmas is one of only 4 days I close my business - so I stay in my pajamas as long as I can, enjoy my coffee, maybe go to the family dinner, mostly just relax. Every year, the family sits around the warm lit fireplace. I pull out my tattered leatherbound copy of "A Christmas Carol" that I have had since I was a child, and I read it to my children. A great tradition.